There are organizations that coordinate the sending of mail to people who would like to receive mail. This one-way communication mostly is geared towards the sick and the elderly. 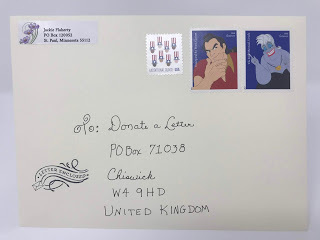 One place I’ve donated letters to is From Me to You in the United Kingdom. They deliver their mail to people in the hospital who are dealing with cancer. On Monday, February 4 they are having their Big Letter Write encouraging people to take time and write and post a letter to brighten somebody’s day. On their website, they offer sample letters and easy to follow instructions. It isn’t always easy to know what to write to a stranger much less to someone dealing with a life-threatening illness. You have no idea how they’re doing, what their prognosis is, if they’re alone. It’s one big question mark. But the odds are good that just hearing from someone who took the time to write a note and send it in the mail to have that letter find its way to the recipient will mean something to them. Tell them about your day. Write about a hobby or sport that occupies your time. Share with them the memory of a recent holiday, or the excitement of an upcoming vacation. Music, books, television or movies that interest you can also be fodder to interest or entice them, or it may just help occupy their time as they manage through another day in the hospital. The website offers excellent advice as well as sample letters. Whether you take part in the Big Letter Write or just write something on your own, you can be assured that the person who receives your letter will be glad you took the time to write it. Did you ever get to the place where you could take on another pen pal?